Provide comfort for the family of Joan Adams with a meaningful gesture of sympathy. 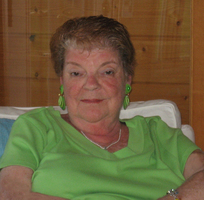 Adams, Joan E., age 82, of Edina, Excelsior Minnesota and Michigan, went home to be with Jesus January 25, 2019. Preceded in death by son John Paul Adams, parents George and Lillian (Whiteford) Lowey, former husband James Adams, sister Jean Mauchline and brother Neil Lowey . Survived by her loving children Julie (Mark) Grube, Steve Adams (and the mother of his children Liesa Altenburg), Timothy (Amelia) Adams, grandchildren Paul Grube, Jake Grube, Nick (Jessica) Adams, Tara Adams, Kirsten (Andy) Rossow, T.J. Adams, Andrea Adams, John Paul Adams Jr., great grandchildren Magnolia, Avery, Aiden and Allen, brother Clinton(Marilyn) Lowey, daughter-in-law Rose Tarquinio McComb and other loving family and friends. . Funeral service 11 AM Monday (Feb,4) at Westwood Community Church, 3121 Westwood Drive, Excelsior, with visitation starting at 10 AM. In lieu of flowers memorials preferred please to Feed My Starving Children or the Union Gospel Mission. We encourage you to share your most beloved memories of Joan here, so that the family and other loved ones can always see it. You can upload cherished photographs, or share your favorite stories, and can even comment on those shared by others.